GESTURE INTERVAL SHOT When one picture won’t cut it: just raise your hand, align it in the box, and make a fist TWICE to capture 4 selfies in sequence. FLASH FOR SELFIE Light up your life with a screen that glows around the photo preview for the ultimate selfie expression with 5MP front camera. TAP & SHOT Life’s an adventure—don’t miss a moment of the action. Focus in and capture it by simply touching the screen. Take crystal clear images with 13MP autofocus rear camera. 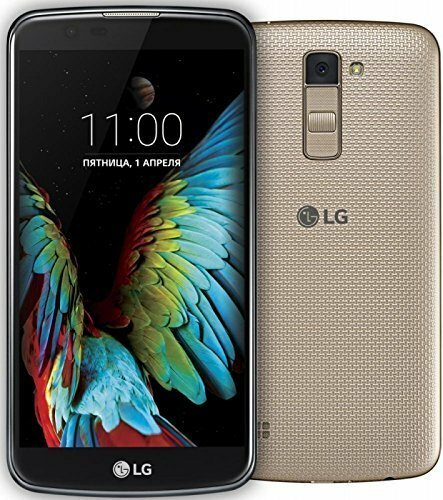 5.3” HD IN-CELL TOUCH DISPLAY LG K10 LTE’s HD display delivers vibrant colors and clear images even in bright sunlight by reducing internal reflective-light. 1.14GHZ OCTA-CORE PROCESSOR Have all your needs met with the LG K10 LTE’s 1.14GHz Octa-Core processor capabilities and experience the power to effortlessly multitask. REMOVABLE 2,300MAH BATTERY Do more for longer by having the option to swap in a full battery for an empty one without stopping to recharge. *****This phone comes with LTE 700/850/900/1800/2100/2600/2300 MHz . 4G LTE does not works in USA. Please ensure with your carrier for compatibility before purchase. GSM model, Dual standby, CPU: MediaTek MT6753, Display Diagonal: 5.3 ", Display Resolution: 720 x 1280, RAM capacity: 1.5 GiB, ROM capacity: 14.9 GiB, Expansion Slots: microSD, microSDHC, TransFlash. Please check if your GSM cellular carrier supports the bands for this model before purchasing, LTE may not be available in the US as this is the international model: GSM850, GSM900, GSM1800, GSM1900, UMTS850 (B5), UMTS900 (B8), UMTS1900 (B2), UMTS2100 (B1), LTE2100 (B1), LTE1800 (B3), LTE2600 (B7), LTE900 (B8), LTE700 (B28). Secondary Cellular Networks:	GSM850, GSM900, GSM1800, GSM1900.